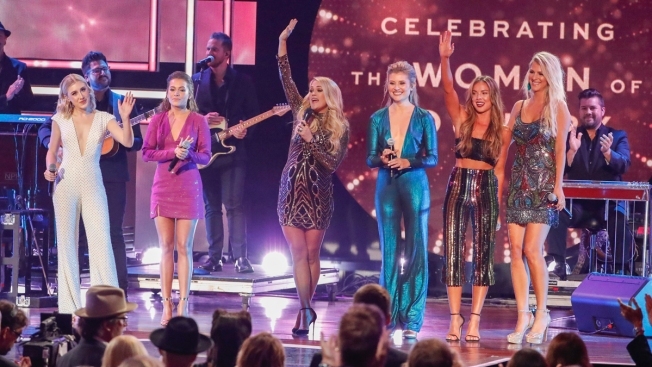 This one's for the girls, during a night when CMT honored all female stars, from Loretta Lynn to Carrie Underwood and Kelsea Ballerini, at their annual Artists of the Year show in an empowering night of lifting up each other. Underwood ended the show with a medley of iconic songs from Tammy Wynette's "Stand By Your Man" to Shania Twain's "Man! I Feel Like A Woman!" supported by two all-female groups Runaway June and Maddie and Tae. "You are not here because you are women," Underwood said. "You are here because you are dang good." Sissy Spacek, who won an Oscar for her portrayal of Lynn in "Coal Miner's Daughter," said Lynn was a trailblazer whose honest lyrics made her unlike any other songwriter in the genre. Lynn, who is 86 and just released a new album, "Wouldn't It Be Great," last month, was unable to attend the show and Spacek accepted the honor on her behalf. Spacek called her "my sister, my best friend" and teared up a bit on stage. "She's just direct and authentic," Spacek told The Associated Press on the red carpet before the show. "She tells it like it is. She can say things that you and I couldn't say, or would be afraid to say." Kimberly Schlapman and Karen Fairchild of Little Big Town sung "Help Me Make It Through the Night" and "I Can't Make You Love Me," with soul icon Gladys Knight. During the show, Fairchild pulled out her iPhone to list off about two dozen women in country music that deserved to get radio play. "She can dream as big and as far and wide as she can possibly can," Scott said prior to the show. "I don't think it's real," Morris said. "I don't think any woman has said out loud, at least to me, 'I don't like to listen to women.' I think that's so ridiculous." "Not a day will go by that I don't honor and lift up women in this industry and want to work with them and collaborate because we have to be there for each other," Lambert said. Kelsea Ballerini and Alison Krauss did a cover of "Ghost in This House." Ballerini said many women that she has looked up to have reached out their hands to her, including Shania Twain, Reba McEntire and Taylor Swift. "What I have learned from this is to lift each other up, to support each other and to share our stage no matter how big or small it is," Ballerini said.